March 14, 2019 -- COLOGNE, GERMANY - Dental journalist Kevin Henry offers the second part of his roundup of some of the new products and services from the 2019 International Dental Show (IDS). This edition features new products and services from companies such as Acteon, Carestream Dental, and more. Here is a look at some of the new products that have caught our eye during this product-driven dental conference. Part 1 appeared on March 12. The 3Delite 3D printer. Image courtesy of DMG. 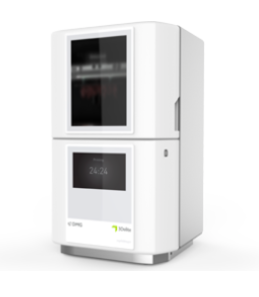 DMG has introduced the 3Delite compact 3D printer at IDS. The printer has been specially designed for short-term, fast production of individual crowns and bridges, splints, drilling templates, and individual trays. It comes with radiofrequency identification (RFID) that allows automatic material identification. This avoids incorrect use and ensures correct documentation of the process data. This product will likely be introduced in the U.S. in 2020, according to DMG. The X-Mind Prime scanner. Image courtesy of Acteon. Acteon has launched its new X-Mind Prime scanner. The lightweight device combines 2D and 3D technologies and allows the practitioner to quickly and easily switch between modes. 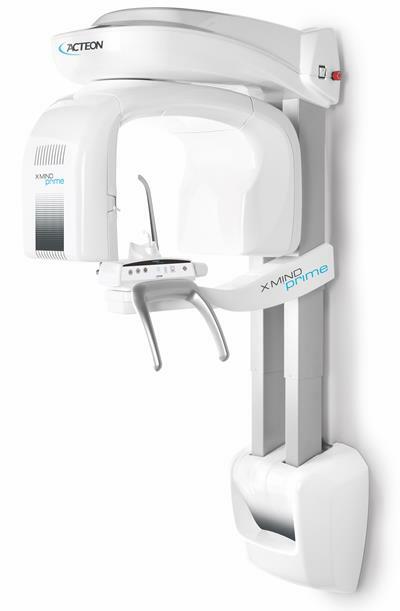 It offers 24 panoramic and 32 cone-beam CT options, covering many clinical applications, including implantology, endodontics, and temporomandibular joint and sinus imaging. Practitioners can also scan 3D objects such as plaster models and silicone impressions, opening up a whole range of new possibilities. This scanner will be available in the U.S. later this year, according to Acteon. Kettenbach has introduced the new Visalys CemCore cement. The dual-curing, holistic solution ensures an optimized adhesive bond and demonstrates excellent stability, even without a matrix. The product is also bisphenol A-free. 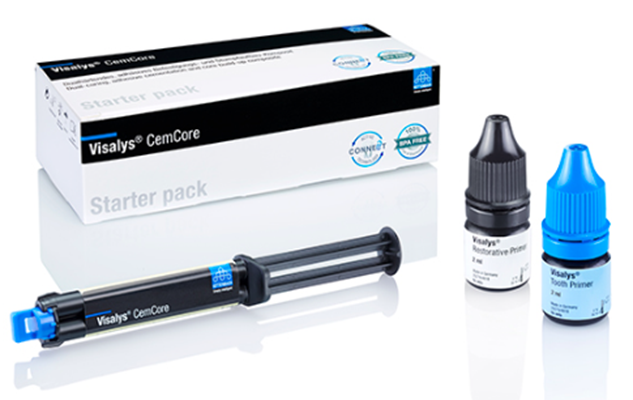 The product is suitable for cementation of all restorations, even in the highly aesthetic anterior region. It can also be used for core buildups. The material maintains a high stability for core buildups while keeping very good flowability when positioning the restoration. This product is also scheduled to be released in the U.S. later in 2019, according to Kettenbach. The Visalys CemCore. Image courtesy of Kettenbach. Splint made from KeySplint Soft Clear for Carbon resin. Image courtesy of Keystone Industries. Keystone Industries and Carbon have released a new 3D dental splint resin, the KeySplint Soft Clear for Carbon. 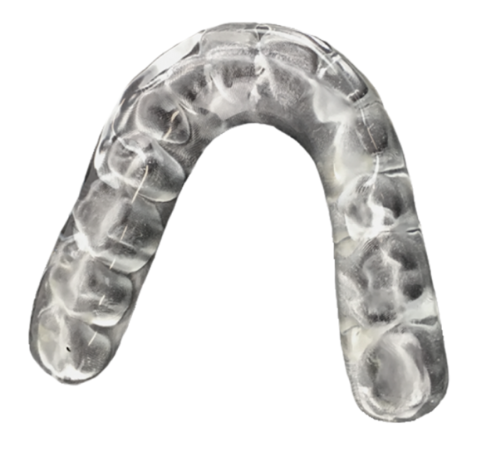 The resin is optimized for Carbon printers and provides a strong, flexible, and biocompatible option for dental splints. This product combines the strength needed to protect teeth with added flexibility for better patient comfort. The end result is easily polished and resistant to stains while maintaining the ability to be easily cleaned by the patient. The material has a shelf life of two years. The resin is anticipated to be released in the U.S. later in 2019 as the first U.S. Food and Drug Administration-cleared 3D dental splint resin, according to the companies. Tokuyama has debuted its new Omnichroma composite. The material is designed to be a single composite for the entire range of tooth shades. It consists of a homogeneous pearl structure that makes the reflection of a precisely defined light wave range possible. It can be used for direct anterior and posterior restorations, directly bonded composite veneers, diastema closures, and ceramic/cosmetic repair. 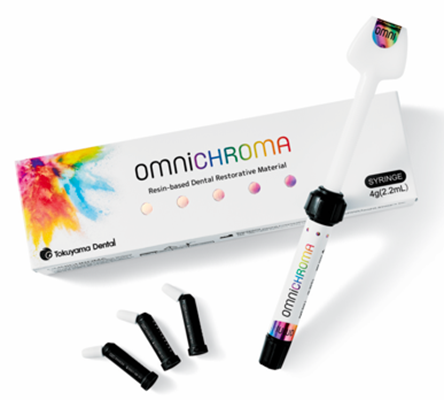 The composite provides continuous reflection across all shades of the entire tooth shade spectrum, eliminating the need for shade determination, according to Tokuyama. The product is available in the U.S. The Omnichroma composite. Image courtesy of Tokuyama. 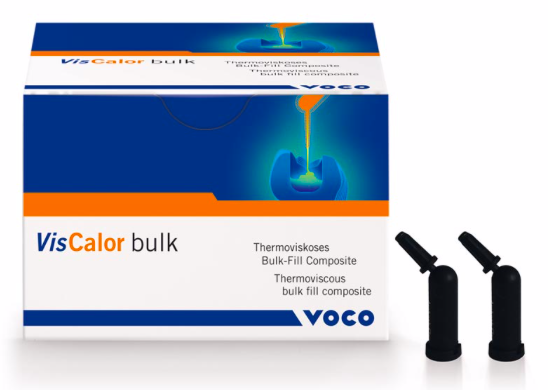 Voco has introduced its new VisCalor bulk-fill composite. The packable bulk-fill composite is the world's first material to use thermoviscous technology. The material acquires the consistency of a flowable material when heated in a standard 68° C composite warmer. VisCalor combines the flowability of a flowable composite during application with the sculpting ability of a packable composite. This allows for efficient single-phase restorations without multiple working steps for base filling, increments, or covering layers. The composite will be available in the U.S. later in 2019, according to Voco. The VisCalor bulk-fill composite. Image courtesy of Voco. Carestream Dental previewed its new CS ScanFlow software at IDS. CS ScanFlow has a new workflow design that will empower users to navigate among different workflows from a single scan and process datasets quickly and more accurately. Touchscreen navigation offers a more intuitive interaction with the software. 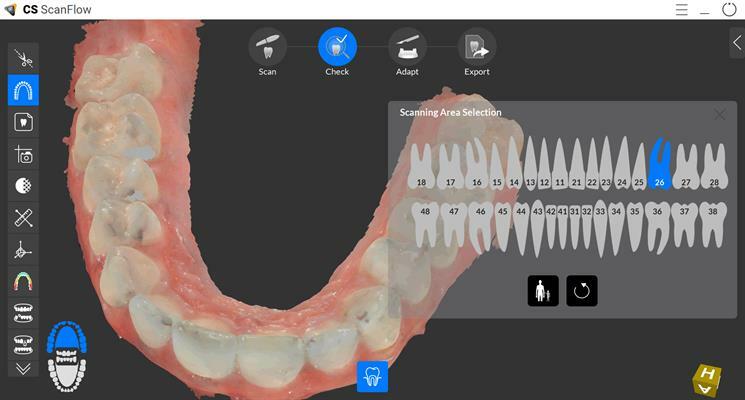 The new software also enables one-click export directly from the software and will enhance the capture of challenging data with restorative and implant-borne restorative workflows, according to Carestream. Current CS 3600 intraoral scanner users who are enrolled in CS Advantage will receive a complimentary upgrade of the new software when it becomes available in the U.S., according to the company. An image from CS ScanFlow. Image courtesy of Carestream Dental. No fee was paid to DrBicuspid.com for inclusion in this editorial feature.